Several doctors are suggesting Clinton has Parkinson's Disease — possibly even in advanced stages. The American presidency may be the world’s most demanding job, aging presidents twice as fast as the general population, and there are increasing concerns that Hillary Clinton may not be up to it. Clinton, 68, has had several medical issues in recent years. During one such incident, while being interviewed by reporters, her head started shaking violently for several seconds. At other times, she has lapsed into blank stares and lost her focus. She admits she has fallen or passed out more than once. Even this week, questions were raised by The Hill about abnormal eye movements during a speech last week in Philadelphia. Clinton’s health is negatively affecting her campaigning. She recently canceled trips to California, sending her husband Bill Clinton in her place to headline Hollywood fundraisers. She went 257 days without holding a single press conference over the past year, only resuming them a few weeks ago. She has missed events that presidential candidates would normally participate in, such as visiting the flood-ravaged areas of Louisiana in August. Some suspect Clinton and her staff are covering up the seriousness of her health problems. After she collapsed near Ground Zero after leaving a ceremony for the 15th anniversary of 9-11, her doctor, Lisa Bardack, released a letter assuring the public that Clinton was in good health and had merely suffered the effects of pneumonia. Bardack, chair of internal medicine at CareMount Medical in Mount Kisco, New York, asserted that Clinton was fit to serve as president. She said a CAT scan of Clinton’s brain in March revealed no abnormalities. In the article, a clinical professor of medicine at New York University, Lawrence K. Altman, explained that Clinton has “had serious medical problems in recent years.” His review of her health issues covered her recent pneumonia, her history of blood clots, the medications she’s taking, recovery from the 2012 concussion and her cardiac health. It revealed areas for concern, including her not having public neuropsychological exams, but no serious medical problems. But the problems Altman highlighted are not the only concerns about Clinton’s health. Further, “Any doctor who has treated pneumonia can affirm that if you are sick enough to pass out, you are not going to recover in an hour to become a smiling, waving Hillary exiting her daughter’s condo.” The bobbing of her head and the exaggerated eye and facial movement are both seen in late Parkinson’s patients, he continued. Parkinson’s patients are notorious for falling during “freeze” episodes because they cannot initiate movement to catch their balance. … People with Parkinson’s very frequently have dementia, cognitive deficits (reasoning problems), mood alterations and can have anger issues. Dr. Erika Schwartz, who treats women’s health, similarly noted on KABC’s Midday Live how strange it was that Clinton was seen a few hours after her September 11 fall waving and talking to people outside her daughter Chelsea’s apartment. “You don’t tend to see the kind of recovery [after a fall due to pneumonia] that Mrs. Clinton seemed to exhibit that day,” Schwartz remarked. What else do we know about the Democratic nominee’s health? Something, if we accept everything in her doctor’s letter, but there’s also a lot we don’t know. Clinton suffered a concussion in 2012. She apparently contracted a stomach virus after foreign travel which dehydrated her, causing her to faint. She fell down in her bathroom and hit her head on the toilet. After she was treated, a blood clot (her third, see below for the history of the first two) was discovered in one of the main veins connected to her brain. Bill Clinton said her concussion “required six months of very serious work to get over,” but — as Altman points out — Clinton’s doctor said she recovered in only two months. Bardack also said the concussion and clots were completely resolved by 2013. Similarly, Dr. Jamie Wells, MD, FAAP, a Board-Certified physician and Director of Medicine at the American Council on Science and Health, notes, “As we have seen with football players and other people with head injuries, traumatic brain injury does not always just ‘go away. '” Orient noted how Clinton telling the FBI she forgot several things may be evidence of lingering damage. Altman noted that head injuries may hasten dementia. They are also considered a possible risk factor for Parkinson’s. Clinton suffered her first blood clot in 1998 while First Lady. It developed in her calf, which is known as phlebitis. Her second blood clot, in 2009, also afflicted her calf, causing it to swell. She refused to be hospitalized as doctors recommended, citing the rigors of campaigning. In 2012, a third blood clot, known as a transverse sinus venous thrombosis since it developed in her brain, forced her to spend a few days in the hospital and take a month off work. She takes Coumadin, a powerful blood thinner, for the clots. Also known as warfarin or Jantoven, it comes with its own additional set of risks. If a patient gets a cut or takes the medication improperly, it can cause heavy bleeding. Some of the possible side effects are so serious they require immediate medical attention. In addition to heavy bleeding, they include dizziness or weakness, bruising without a cut, and red or brown urine, among others. Clinton developed a sinus and ear infection last winter. As a result of progressive pain in her left ear, a myringotomy tube was placed in her left ear. Myringotomy is considered minor surgery, but it requires general anesthesia. Last year, Clinton started coughing frequently during debates and interviews. Her doctor asserts it is allergy related, but it could also be a symptom of Parkinson’s Disease, since those afflicted sometimes have difficulty clearing their throat due to lack of motor control. Clinton has a sluggish thyroid, known as hypothroidism, for which she takes medication. In 2009, she slipped inside a government garage and fractured her elbow — another fall. She still has not released her medical records from her White House years, which could reveal even more serious issues. Stage four may require a walker. According to Healthline, “Many people are unable to live alone at this stage of Parkinson’s because of significant decreases in movement and reaction times. Living alone at stage 4 or later may make many daily tasks impossible, and can be extremely dangerous.” If Clinton does have this debilitating disease, there is a very good chance if elected president she will not be able to complete her term, requiring her vice-presidential pick Tim Kaine to relieve her as president. 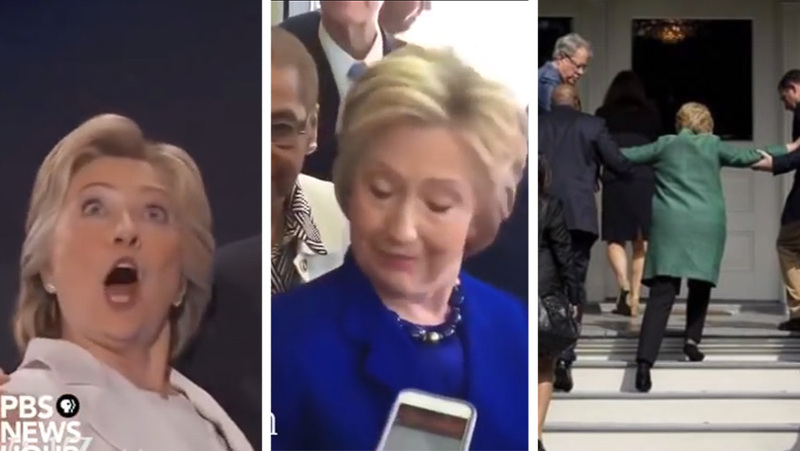 On Wednesday, Hillary Clinton was asked by reporter Sarin Fazan of ABC News’ Tampa affiliate WFTS whether she would, as some doctors have suggested, take neurocognitive tests. She laughed off the suggestion. Regardless of what may be ailing Secretary Clinton we pray for her health, that she receives the proper treatment and that she will trust the American people enough to share with them the truth. What a choice – a late-stage Parkinson’s patient versus a psychopathic narcissist. I’m voting third party this year (Constitution Party). Why “a psychopathic narcissist”? Proof? BTW, all people are to some extent narcissistic. It’s incredible to me that of all the people who constantly are surrounding her – staff, Secret Service, medical personnel, and even family – not one person out of what has to be dozens has the guts to go public with what’s really going on with her? Not even for her own benefit and safety, so that she doesn’t literally die? Not even her own family cares enough about her to beg her to stop the campaign and get help? Can I assume since President Clinton was impeached that alone disqualifies him from running for President again? How much of what is in this article is President Obama aware of & intends to use this or her indictment to take advantage of a grievous situation – if Hillary was elected & step in before swearing in of Hillary & Tim? I am appalled that the political gurus are so willing to sacrifice so much to get the Presidential prize. My heart goes out to Hillary Clinton for the health issues she has encountered & what lies ahead in her future. I would not wish this on anyone. Bill Clinton is not showing any protectiveness/support toward his wife/life mate that one would expect. Yes our hearts go out her future lies as well. There are many reasons NOT to vote for Hillary, and her health is the least. I do not feel sorry for her. She and her husband together have killed more ppl than some infantry in the army. She’s a rotten person, a serial liar, and she stands up for nothing but her own enrichment.